George Mason (16-12, 10-5) made a welcome return to defensive form and hit some big shots from beyond the arc during a solid 77-63 victory over Richmond (12-16, 6-9) Wednesday night inside EagleBank Arena. Mason limited the Spiders to 38.9 percent (21-54) from the floor and just 5-of-18 from 3-point range (.278) in the win. The Green & Gold also hit 10 3-pointers for the first time since January 3 and shot a blistering 55.6 percent from deep. With the victory, the Patriots reach 10 A-10 wins for the first time in their six seasons in the league. Mason sits at 10-5 in the conference with three league games remaining. With the return of Calixte and Boyd, Mason was able to wear down the Spiders with a relentless attack from different guys throughout the game. A total of six Patriots scored at least six points, while four reached double figures. A total of 56 of Mason’s 77 points came from freshmen and sophomores on the night. Freshman Jamal Hartwell II put together a breakthrough offensive night to lead the Patriots while also playing outstanding defense on Richmond star Jacob Gilyard. Hartwell II tallied a career-best 15 points and made 5-of-9 3-pointers (.556) in a personal-best 31 minutes on the floor. He limited Gilyard to just 2-of-10 shooting and eight points. In the Feb. 6 game at Richmond (which Hartwell II missed due to injury), Gilyard poured in 28 points on 9-of-13 shooting. Fellow freshman Jordan Miller added his second double-double of the season (13 points, 10 rebounds, 6-9 FG), while sophomore Javon Greene added 14 points (4-7 FG) and six rebounds. Calixte chipped in 10 points off the bench and grabbed four rebounds in 18 minutes. Mason was +9 (40-31) on the glass in the game and dished out 15 assists on 28 field goals. The Patriots have out-rebounded their opponent in six of the past seven games. Richmond made four of its first five shots and jumped out to a 10-2 lead. The Spiders extended it to 10 (16-6) but Mason cut it to five (20-15) after Miller’s fourth basket at the 10:08 mark of the stanza. Richmond led by six at 29-23, before Mason closed the half on a thrilling 9-0 run, capped by a deep Hartwell II 3-pointer to end the period. After Richmond started the half 4-of-5 from the floor, Mason limited the Spiders to just 5-of-21 for the remainder of the stanza. Richmond moved back in front by three (35-32) early in the second half, but back-to-back triples from Hartwell II helped the Green & Gold extended the lead back out to seven (44-37) at the 13:50 mark. The Patriots led by that margin at 50-43, before Mason pushed it out to 12 after a jumper from Greene with 8:56 to play. Hartwell II hit his fifth 3-pointer to extend the edge to 15 (65-50) and Mason made it 19 (75-56) on a triple from Green with 2:04 remaining. 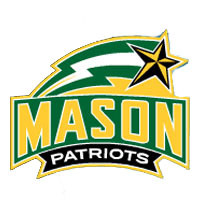 The win gives Mason 11 home victories this season – the most by a Patriot squad since 2011-12. The Patriots are now 15-11 all-time vs. the Spiders in Fairfax. Mason hits the road for a nationally-televised showdown with Saint Louis on Saturday (March 2). Tip-off inside Chafeitz Arena is set for 3 p.m. (ET). The game s first will be broadcast on NBC Sports Network.